Mary Morstan was a short blond in her late twenties, a primary school teacher by profession, orphan by misfortune, and reasonably good at karaoke. That was unfortunately about as much about Mary as John had ever really told Sherlock in their e-mails. He'd mentioned they'd had good times together, perhaps shared a few quick stories about particularly humorous or outrageous outings in which she was a part of, but as far as describing her as an individual person, he'd erred on the side of caution. He didn't doubt for one second that Sherlock had read into things, deduced from them some manner of further detail about the woman he planned to marry. It made him wonder what all could be deduced from her as he watched her fill the kettle from the sink, her straight back to him as they waited for Sherlock to dress. His friend probably knew exactly who she was down to her favorite color after standing in a hallway with her for only a matter of minutes. What did he think? What clues had he seen? Sherlock's way of looking at the world and people had always been fascinating, even when it drove him mad. It was a skill John'd pretended at on occasion and felt himself inclined to do again in the awkward silence. Mary's earrings were ornate with small, yellow sapphires set in polished gold. The style was middle eastern or Asian and they were genuine, not costume imitations. They didn't match with her beige and pink attire so they were likely worn for sentiment. Not a gift from John, no--they were too valuable to be purchased with an army pension and a surgery paycheck. Being a known orphan, it was likely the earrings had come from a parent. Not a style most older women would fancy so not a handed down piece from a mother and therefore a gift from her father. Her straight posture and sure chin pointed to a very disciplined upbringing with her more conservative clothing choices making it even more pronounced. Why then would a strict father purchase expensive, foreign looking jewelry rather than a set of classic pearls like the set she wore around her wrist? A military man stationed abroad--the earrings were a souvenir. John smirked to himself just a little, very much pleased at the way he wound his way to her father's profession from his own cheap imitation of Sherlock's brilliance. It was very easy when one knew the answers in the first place. He had no doubt at all Sherlock had mapped out her life's story in one look. John wondered if there was a line somewhere on her face that said she was funny, though, or a way in which she moved her eyes that let on as to how generous she was with her time and how close-fisted she could be with her money. Could Sherlock see in the way she made tea just how much she loved football or that she fancied Chelsea? Was the way she flipped her hair back over her shoulders capable of letting slip that the most embarrassing moment in her life was sneeze-farting during prayer at mass aged eleven? John sometimes envied Sherlock's ability to know people at a glance but it was very hard to take for granted the level of knowledge available through years of conversations and laughs. In many ways, he preferred his own methods. Making memories was part of life's enjoyment. He'd made many wonderful memories with Mary. He tried not to think too much about the fewer but more intense ones he carried with him from his life with the consulting detective. The door to the bedroom opened and Sherlock ghosted down the hall to the living room, the sound of him falling into the couch likened to a wheezing sigh from the disguised leather. John watched Mary flinch slightly at his returned presence as she busied herself with the tea. Awkward and tense. John stood and gave her shoulder a pat, not sure how angry she still was at him or if a kiss would earn him a scowl. Her shoulders were drawn taut but she did not shrug him off. He gave her cheek a quick peck to be sure then walked out to the living room to debrief the now briefed Sherlock. Though he'd told him to help himself to his clothes in the interim, John hadn't expected Sherlock's selection. Laying on the couch as though he too owned the place still, Sherlock blended in with the beige upholstery cover in a rather old cable knit sweater that looked heavy and warm indeed. The well-worn jeans he'd located were most certainly too short but not too loose despite the narrowness of his frame. He looked normal--not Sherlock normal but every other bloke sort of normal. John Watson normal. In a way it made it the most convincing disguise he'd even dawned. It was a little like looking at a child playing dress up in daddy's clothes. There was something about that sweater though. John hadn't seen it in years--hadn't worn it in longer. He'd forgotten he had it. He decided he liked Sherlock in it, even if it didn't fit with his mental image of the man who was forever in tight button down shirts and impossibly well tailored suits. Sherlock looked warm and cozy enough in the bulky sweater at the least. "Like I said, we can go through the boxes upstairs later. Get you your own stuff down," John said, choosing not to remark on his choice in clothing. He could do so later when complaining about the assured mess he'd made finding something suitable. Sherlock nodded, a lump of immovable mass now that he'd settled in for the coming chat. His right hand felt along the pattern of the sweater against his stomach, miming hunger, perhaps, or more likely just being tactile. He looked over at the kitchen, face scrunched and sullen. "We'll be having something more substantial than tea and biscuits I hope." "I'll take us all out later if you like. Just.. really don't need to have this all out in public." "Thought by now you were used to defending your sexuality in public." "Yeah, well, saying 'I'm not gay' is an easy fix to most suspicions but explaining why I'm sleeping in bed with a naked dead man generally requires something a bit more substantial." John rubbed at the back of his neck, the anxiousness and slight terror at Mary's rather well supported conclusions still bubbling away inside him below the soldier's trained calm. He was this close to proposing to her and he'd almost seen her walk out of his life forever thanks to necessary secrets and an alarming lack of tact. "And thanks for that, by the way," John added with dripping sarcasm, giving his friend an unappreciative look. "Would it have been too much to have thrown on clothes instead of bedding?" Sherlock shrugged with his eyebrows, unimpressed. "She's still here," he pointed out in his usual superior tone. Yes, she was. And John had been completely lost before he'd stepped in. In the hundreds of ways it could have gone better, there were thousands in which is would have gone worse. "Alright. In all honestly, truly, thank you. But what happened to the bit about this being a dire secret? I thought there were possible assassins out there waiting for an excuse to blow my brains out." "Well, if you're going to spend the rest of your life with her, there's no trouble in asking her to share this small secret now." "Small secret?" John scoffed. "Sherlock, small secrets don't normally involve threat of death." Mary set the tray of tea down on the short table in front of the couch with just a tad too much force. The cups chattered on their saucers, the milk sloshing just a bit over the top of its porcelain container. Under her breath she apologized and gently began setting the plate of broken biscuits and a mismatched serving set within Sherlock's reach. "You're out of nibbles, John. Sorry," she said, pouring for them all with her middle finger gently holding back the lid to the piping pot. John put a hand to her back, rubbing along her shoulder blades between the straps of her bra. "No, don't, don't worry about that. I'll go shopping. Need to buy some of the essentials for Sherlock anyway before he decides to help himself to my toothbrush." He paused. "You haven't, have you?" Sherlock picked up a half-moon digestive with a frown. "In what detestable manner do you think I've been using my mouth that would contaminate your toothbrush beyond its current scope? You leave it uncovered in the bathroom, John. It's not exactly a sterile environment." "Make that two toothbrushes," John was going to strangle him. "In fact, why don't you start thinking up a list for me and I'll take charge of explaining things." Sherlock had already pretty well proven what kind of help he was going to be in this: none whatsoever. His indifference was easily misinterpreted as jealousy and his inconsiderate behavior came across threatening and territorial. John was used to it; John knew what was normal and what was put on for display. Mary, despite having heard an embarrassingly long list of stories about the legendary consulting detective, was not nearly prepared enough to handle the force of Sherlock's personality. Mary tucked two lumps of sugar into her own milky cup before picking up her saucer and finding a seat close to Sherlock. "Actually, I'd rather like to hear this from him," she said, looking towards the dark haired man. She rested her tea on her crossed knee, her gaze somewhat challenging. John stammered as warning lights flashed in his mind. "Him? From Sherlock? Ah, Sherlock's not exactly--"
"I've heard it all from you already, John. No reason to make you repeat yourself." She smiled at him but let the expression drop as she turned her face again towards Sherlock. "So why don't you tell me, Mr. Holmes, what your relationship is to my boyfriend?" John looked towards the skull where the ring was hidden. Divert. Divert! "...Can I at least give a forward to his testimony?" "I'm quite capable of describing our relationship, John." Sherlock sat up, the full weight of the sweater showing as it hung from his shoulders rather than hugged against them. He took up his tea, meeting Mary's calculated look with one of his own. "Yes, but you're an idiot and you don't realize what people hear despite what you're actually saying sometimes." "You need an example?" John shook his head, almost finding it hard to pick from the multitude the one which would paint the best picture. "Okay, Sherlock, our first supper together. I asked if you had a girlfriend and you said 'not my area'. 'Not my area' is not the same as saying 'I'm asexual and/or too busy to be bothered with love'; 'Not my area' sounds like 'no, John, I'm gay' to everyone who isn't you." Sherlock's mouth became smaller as his eyebrows fell against his eyes. "I can hardly be held accountable for your false assumptions. Besides, I set the record straight when I turned you down." "Christ, Sherlock, I wasn't flirting with you! We'd just met! I was sorting you out!" John put his face in his hands, begging any gods alive to please make his friend shut up. "You see what he's like?" he asked, looking at Mary, imploring her to reconsider. "You honestly want to hear this from his end?" "Honestly, yes. More than ever." "The woman knows what she wants, John." "I'll just go hang myself now, shall I?" "Don't worry; this won't take but a moment." Sherlock washed down his bite of biscuit with a splash of tea then set both aside for his frank and uncomplicated explanation. "John is my best friend, in many ways my only friend past and present and I intend to keep him well into the future. Last night was not an intimate affair but rather two friends comforting each other in light of rather obvious facts brought to light. If it makes you feel better, as it did John, he slept on top of the sheets." Mary nodded, eyes bright. "Are you in love with him?" she asked without the slightest trepidation. John found his bottom lip stuck between his teeth. "I would die for the man," Sherlock said simply. "You did die for me," John corrected. Mary looked between them, her tea untouched. "So it's purely platonic then?" John nodded, looking away from Sherlock's pale, ash grey eyes. "Absolutely. One hundred percent." "I can assure you that all my relationships are platonic in nature. I'm no more physically attracted to John than I am to you," Sherlock explained, comfortably leaning back into his spot on the couch. "Though frankly," he continued, "I'd prefer to shag John." John was glad he hadn't sipped his tea at that moment or he'd have choked. He put his cup and saucer down, clearing his throat of all the words he'd like to say to make way for the ones that mattered. "That.. that didn't need to be said. At all. Ever. To anyone." Sherlock looked genuinely confused. "What?" "This is exactly what I was talking about! How the hell does 'I'd shag John' sound the same to you as 'I don't think with my-'--You know what? Never mind. It doesn't matter." Besides which, there was a lady present and John had worked hard to be a gentleman in front of her at every opportunity. He turned to Mary, engaging every bit of body language he was fluent in to try and demonstrate his frustration. "Mary, this is my best friend Sherlock. This is what I had to put up with for over a year and somehow what I had missed for ages afterwards. And it's extremely, extremely important that no one else know he's here or that he's even alive." Funny business aside, it was more than time to move on to the more serious matters at hand--a suggestion that his phone seemed to have other opinions on. John looked over at his mobile as it gave its short chime and lit up on the desk behind him. Well more than half the time his text alert sounded it was Mary. Half of the remaining bit was James Sigerson. It certainly wasn't either of them. Curious, he stood up and collected the phone, sliding his thumb across the screen to view the sender's name and message. "How are you alive?" Mary asked, "John said he saw you die. We've been to your grave." Sherlock ignored her question, eyes following John. "Mycroft?" The good doctor closed his phone and walked quickly to his bedroom. Out of Sherlock's mess he picked up some jeans, pulling them on over his sleep pants. Layers would help in the cold anyway. He didn't bother to change out of his plain undershirt as he pulled his coat on over it. Mary came to stand at the door, worry pinching at her eyes. "John? What's the matter?" "Nothing. I need to talk to someone; won't be long. Sherlock will explain everything while I'm out. Keep an eye on him for me, will you? " John took her by the shoulders, guiding her back down the hallway whence they came. He pressed his cheek to hers as the guidance became a one armed embrace, faces turning to kiss in quick parting. "I love you." John's smile grew as his heart warmed. Everything was going to be okay. He pressed her back into the living room, giving Sherlock one last look before heading out. "Best behavior. I mean it," he warned, more so he could say he had than with any belief it would make any difference. "Always," Sherlock replied, validating his expectations. John kissed Mary one last time, her soft lips lingering, then hurried down the stairs. His heart was pumping strong in his chest with a swell of importance and purpose. It was like the good ol' days all over again. Twenty-four hours ago he had been sitting in his surgery with normal concerns like rail traffic, dinner plans and when to schedule in laundry day. Now he was possibly an assassins target and en route to speak to the most powerful man in England. Sherlock wasn't the only one to have been resurrected the night before. John hadn't felt this alive in ages. On the street's edge was a polished black car with an attendant standing at the back passenger door. Wordlessly the man nodded his head and held it open for John, standing aside to allow him to slide inside. No words were required; John knew the drill. He ducked in and took his seat on the shining black leather, expecting to see the distracted Anthea in all her unattainable glory. Mycroft's somber, lined face was not at all what he had expected. "This is a surprise," John said as the door closed beside him. Mycroft smiled briefly, faked. "I find there are few places private enough to discuss these matters," he explained. The car engine started with an expensive sounding purr. With a privacy glass between the driver compartment and the back of the vehicle, John had to agree the setting was quite secure from prying eyes and ears. The tinted windows that kept the man seated across from him hidden from the world's view made the car its own little haven for the privileged--a black, rolling office for a quick, meaningful chat. John looked at Mycroft in his impeccable suit and tie and made himself sit up just a bit taller. The elder Holmes hadn't changed a bit. John had made a habit of avoiding him over the years but could see plainly that while some worry lines had grown deeper, he was still no different a man now than he had been then. His eyes were still cold, his smile still tinged with practiced superiority, his presence was still one of power and collected calm. His were the lips that had launched a thousand tabloids and sent a man falling to his death. Sorry hadn't cut it back then and John still felt himself hard pressed to forgive him now. "Yeah, I can see how you'd want to avoid making a scene seeing as I'd still like nothing more than to punch you in the face." Mycroft continued to be less than amused. "Striking me would do you very little good, Dr. Watson. Matters are more complicated and dangerous than you can imagine." "Oh, I'm quite good at imagining danger. I'd have thought sometime in three years, though, that someone would have mentioned to me that my name is on someone's hit list." "You were in no danger so long as Sherlock remained dead." "Yes, well, he's not dead." John rubbed at his knees, making an effort not to shout. One never won anything against a Holmes by shouting. "Would have liked to have been let in on that little secret as well." 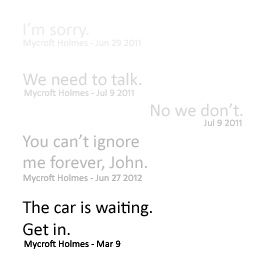 Mycroft breathed out slowly. "There were reasons-"
"Yeah, I know all about the reasons, Mycroft. My question for you is what you're going to do about it now. Because now that he's here, there is no way in hell I'm letting you ship him off to Libya to wait out the rest of his life for a chance to come home. We're fixing this now. You owe me that much." The official's face parted into a perverse smile as he chuckled. "I owe you?" he repeated, smile melting from mockery into anger. "Have you any idea the efforts I've made to get him even this far? If it weren't for you, he'd be retired somewhere safe solving cases for fun instead of investigating crime syndicates and terrorist cells looking for every last man who stands between him and his beloved blogger. Three years spent jetting across most of Europe and half the other continents for the singular hope that things could be made right again. You showed my brother he had a heart just in time for someone else to break it. I should be asking you what you intend to do about it." John breathed his indignation out through his nose, chin dimpled in thought. "You expect me to feel sorry for showing Sherlock the same courtesy that every other human being in the world is privy to?" "No, I expect you to take responsibility and protect him." Mycroft looked down at his pocket watch, breaking off his stare for the first time since John had entered the car. "You are both vulnerable while he's here," he continued. "And Sherlock will die before he accepts defeat in this case." "You don't actually have to ask me to watch his back, Mycroft. I do it anyway." "Good." Mycroft took up a briefcase and set it in his lap, unlatching it with a loud click. He opened it just half way, pulling out of it a file with a post-it note affixed to the top which read 'Sigerson'. He passed it across to John before setting the briefcase back down. "Something has come up. Normally it wouldn't flag suspicion but considering it happened on the eve of Sherlock's return, it could mean something. Ronald Adair, a returned solider not unlike yourself, was found dead this morning with a bullet wound to his head. The room was locked from the inside and no weapon was found." John flipped open the file, finding the standard photos and police reports detailing the crime. He flipped through the photos, not at all bothered by the sight of blood. "Couldn't have shot himself then. Alternate escape for the murderer?" "Sounds like the kind of case Sherlock would enjoy," John admitted. Mycroft nodded, fingers tenting in front of his lips as his brother often did. "I agree. Especially since the striations on the recovered bullet are a close match to several others found in similar hits." John's heart skipped a beat. "Hits? You mean this was an assassination?" "That or this serial killer has coincidentally taken down a handful of rather influential people." "You think this could be one of Moriarty's boys? Someone who knows about the deal?" John closed the file, his fingers itching for his Browning. "Right... We'll get right on it." He could feel the car slowing, see through the tinted glass the familiar sights of Baker Street. A short conversation only needed a once around the block. The doctor looked back at official, hands already gathering up the file to take with him, ready to leave immediately once the car came to a full stop. Mycroft sighed, tapping his fingertips together. "You don't have to do this. Sherlock and I can take care of this ourselves. I hear you're going to be married." John knew better than to be surprised but still found himself a little put off at the idea of Mycroft keeping up with his life. "I haven't exactly proposed yet but yeah. That doesn't mean I'm going to just sit back while Sherlock deals with this. Like you said, he's my responsibility." "So is her involvement. Can you truly protect them both?" Mycroft smiled. Though the car had stopped, the locks remained engaged. He shifted forward in his seat, resting his chin on his interwoven fingers as he looked out at the darkness of the world outside. "My brother is a selfish man despite whatever selfless choices you believe him to have made. If you let him take control of your life again, you may never get it back." "You're wrong, Mycroft," said John, never one to back down from an opportunity to defend his friend in the face of his brother. "Am I?" Mycroft tapped a finger on a side panel, a signal apparently ringing in an attendant's ear as the suited man came to stand beside the car, pulling open the door with the same poise and importance of a man performing a much more grandiose task. "Be careful, Dr. Watson," Mycroft warned as John scooted his way out the door. "You have more to lose this time than ever." With the file in hand, John kept his back to the official and hurried back to his flat. He'd learned long ago only to hear but never to listen to the words the guilty man said.